has been added to Fujitsu and Fujitsu Frontech's line of palm vein authentication devices. Sales of the new products will commence in late October. In addition to dramatically easing the conditions for installation and usage environment by improving operability and environmental tolerance, and becoming slimmer, PalmSecure-F Pro features greater identification accuracy, and provides greater functionality for identifying individuals from among a huge database of registered palm vein data. In addition, offering the Palm Vein Authentication Board with embedded software enables application to devices with embedded-type operating systems, which previously had been difficult. As a result, whereas applications had previously centred on PC login and room access devices, scenarios for use can now be expanded to such equipment as multifunction copiers, vaults, and lockers, allowing companies to standardise their internal authentication method with palm vein authentication. Fujitsu and Fujitsu Frontech will also seek to grow their presence into new markets, such as using palm vein authentication for “walletless” payments in lieu of cash or credit cards, or as an alternative to keys for residences or vehicles. In recent years, to prevent damage caused by information leaks and identity fraud, biometric authentication technologies are becoming more prevalent. Among these technologies, palm vein authentication, which reads the pattern of veins in the palm, offers the benefits of being highly accurate and difficult to forge, with superior authentication performance. These features are why it is used by over 70 million people around the world in such applications as verifying customer identity at a bank ATM, for PC access management in companies, and for room access management. Excellent authentication accuracy and convenience have led to rising demand to embed palm vein authentication in a variety of equipment, with needs to expand the number of operating systems that can run it, and to enhance environment tolerance, such as to temperature extremes and sunlight. 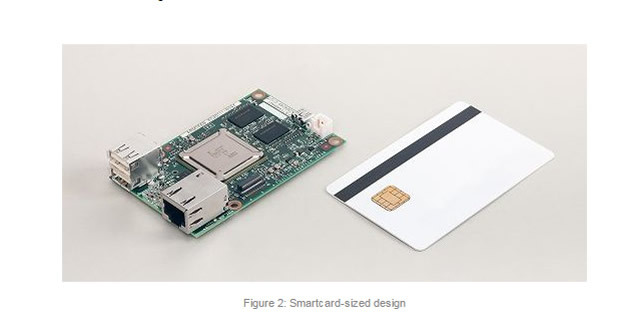 The Palm Vein Authentication Board is a compact, smartcard-sized control board with firmware that processes such functions as image capture, registration, and authentication. Previously, use of palm vein authentication was restricted to such operating systems as Windows and Linux, but this product makes it possible to build vein authentication systems that are independent of the operating system. These two products will be exhibited at the Fujitsu Frontech booth at the 18th Auto-ID & Communication Expo, which will be held from 14th to 16th September, at Tokyo Big Sight. Fujitsu and Fujitsu Frontech have achieved a height of 13mm, less than half that of the PalmSecure Sensor V2, while maintaining the same authentication accuracy. This has made it possible to incorporate it into more compact devices. This version features the capability to rapidly capture multiple images of a palm, select the best image almost instantly, and automatically verify it. By incorporating a high-performance image sensor, the shutter speed has been improved to about five times that of the previous model, shortening the image-capture period, and limiting image blur. This has enabled the sensor to authenticate a palm with a more natural gesture while maintaining the same high accuracy as the previous model. The range of environmental conditions in which the new model can be used has been significantly expanded with regard to temperature and sunlight compared with the previous model. This has made it possible to use the new model in a variety of situations, including outdoors. This sensor employs sophisticated technology for the extraction of only the data required for palm authentication image capture. In this way it realizes highly precise authentication, specifically, a false rejection rate of 0.01% (one retry), and a false acceptance rate of less than 0.00001%. It is possible to recognise an individual from data of up to 10 thousand hands (five thousand people with both-hand registration). As one type of technology used to realize this high degree of precision, the PalmSecure-F Pro adopts a Fujitsu Laboratories-developed palm orientation compensation technology. The new board features a compact design (85x54x20mm), about the size of a smartcard, suitable for embedding even into miniature devices. Image capture, registration of new palms, and authentication are all done by software on the Palm Vein Authentication Board, eliminating the need for a Windows or Linux operating environment. This enables use in devices with embedded OS, such as multifunction copiers. 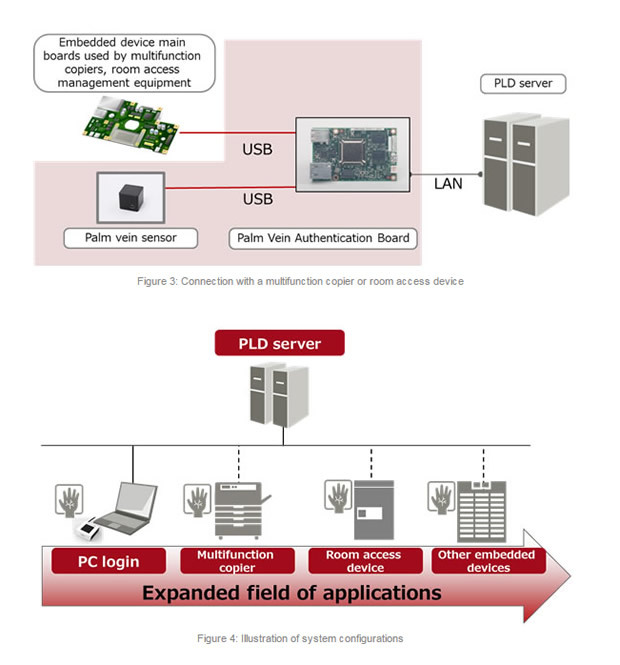 In addition to the stand-alone version which stores palm vein data on the board, the Palm Vein Authentication Board is also available in a server version that can connect with PalmSecure LOGONDIRECTOR (PLD), PC login software (available only in Japan). Using this version, registration data stored in the PLD server can also be used from devices requiring authentication, enabling integration of palm vein authentication across a variety of devices.